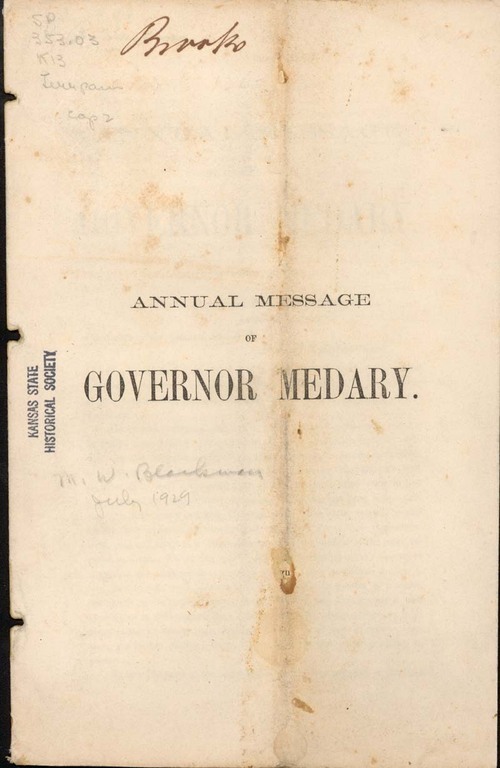 Governor Medary addressed his annual message to the Council and House of Representatives of Kansas Territory from the executive office in Lecompton, Kansas Territory on January 3, 1860. At this point, the Wyandotte Constitution had been approved and was awaiting action by Congress. Medary outlined a number of issues that the legislature needed to resolve. These included the organization of counties and townships, setting interest rates, public schools, procedures for selling public lands, bank charters, a penitentiary, a territorial library, and railroads. He indicated that he believed a law passed by the last session of the legislature deprived many citizens of the right to vote that that law needed to be changed.